Keep the princesses clean at your next Beauty and the Beast themed party with the Beauty and the Beast Luncheon Napkins! 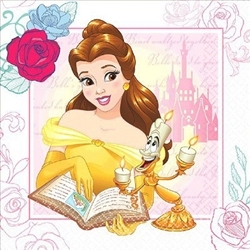 These napkins are printed with a lovely image of Belle reading a book with her friend Lumiere. Sixteen generously sized 2-ply paper napkins are included in each package. Check out our other coordinating Beauty and the Beast accessories.